Brown ground beef and drain. Spoon 1 C. spaghetti sauce in bottom of 4 quart crock pot. Mix remaining sauce with beef. 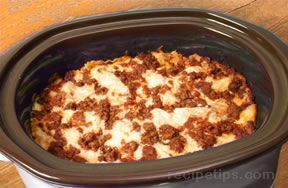 Place 2 uncooked lasagna noodles on sauce in crock pot. Spread 1/3 meat mixture on top of noodles. Spread 3/4 C. cottage cheese over meat. Sprinkle 1/2 C. mozzarella cheese over cottage cheese. Add another layer of uncooked noodles, 1/3 meat mixture, the remaining cottage cheese and 1/2 C. mozzarella cheese. 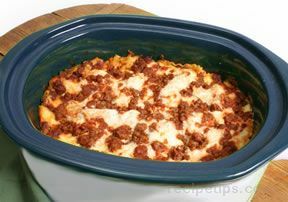 Place another layer of uncooked noodles, meat mixture, and mozzarella cheese. Sprinkle Parmesan cheese over top. Cook on low for 4 hours. "I have also used Italian Turkey and Italian Sausage as well as switched the ricotta for cottage cheese small curd"
"We LOVE this recipe! It's the only lasagna I make now! Thanks so much for the recipe!! I make it all the time, it's budget friendly, easy and delicious!" "I have a crockpot smaller than a 4 quart. Won't hurt to try it out N make it. 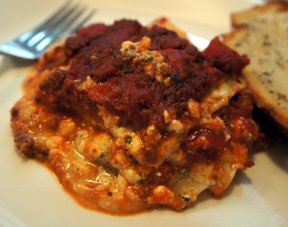 I love lasagna"
"Can i add extra ground beef to this?" "Just wanted to say, I love this recipe. I never cook, so I was nervous to try it especially browning the beef but it was so easy to make. My fiance loves it and always asks me to make it. It's affordable too. I'm so glad to have found a meal so cheap, easy, quick, delicious AND filling! I recommend it for sure!" "I have made this several times now because it is soo easy and my picky ten year old loves it. 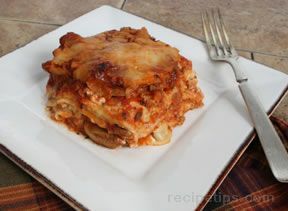 Just wanted to mention that oven ready lasagna noodles work great for this delicious recipe." "This recipe was FANTASTIC!! My picky ten year old LOVED it and wanted seconds. The recipe was followed as instructed, but I was VERY liberal with cheeses, and used more than the recipe called for. I used a 2 cup bag of mozzarella cheese, and put the entire bag in. I used lean ground beef 96% lean 4% fat. This will be a staple in my house. I will be making this again after payday. I used EMERILS Marinara sauce for spaghetti sauce and that was perfect. I used Fiber One cottage cheese. Yummy perfection and super easy!!!!!"